LEVEL Airlines is the newest member of IAG (holding group owner of British Airways, Iberia, Vueling and Aer Lingus). 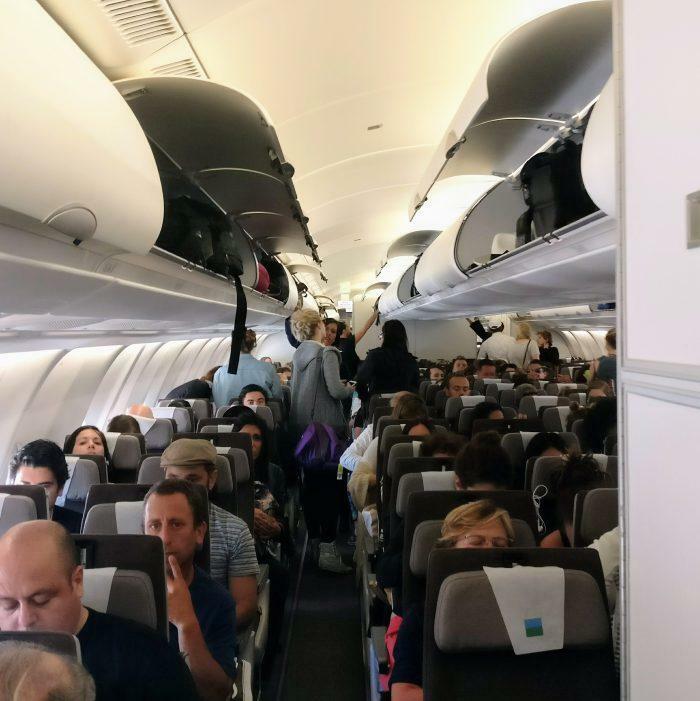 The airline, that started operations today with 2 aircrafts and 4 routes, is IAG’s bet for the long-haul Low Cost market and a direct response to Norwegian Airlines long haul flights between Europe and the Americas. 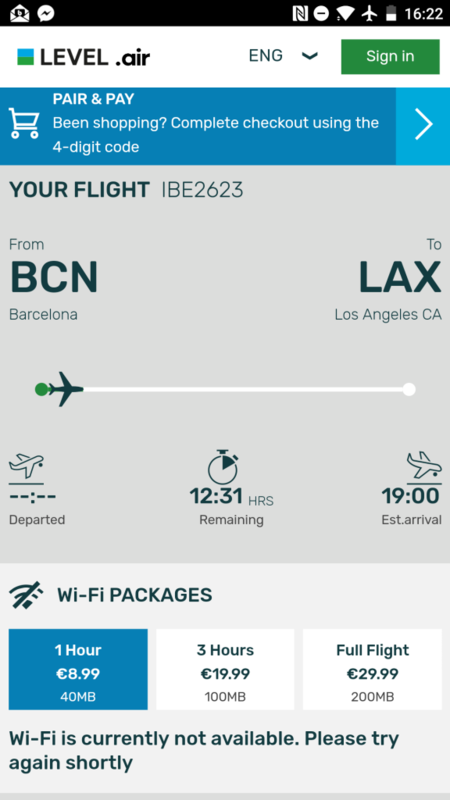 Not often you get the opportunity to be part of the inaugural flight of a new carrier, and being Barcelona based myself, with a long holiday weekend ahead and no other plans, I booked myself on their very first flight. 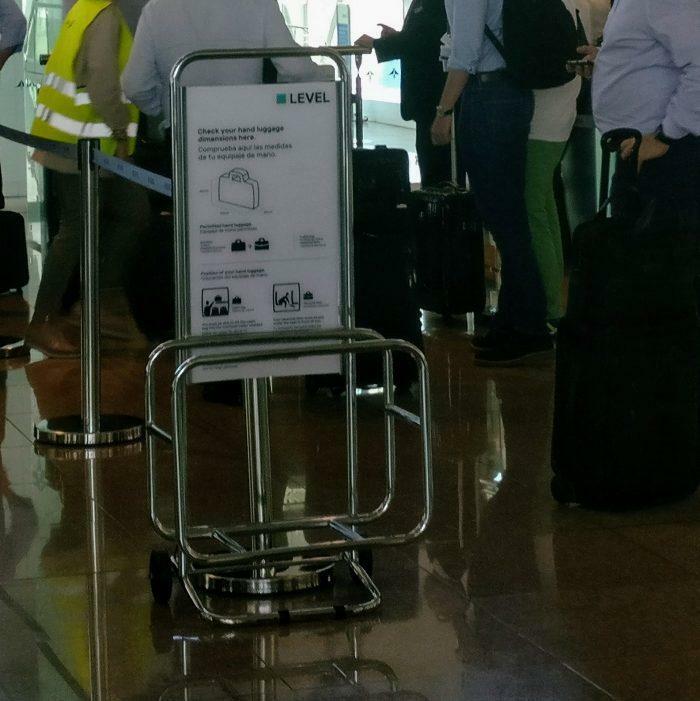 LEVEL offers online check-in 48 hours before your flight. 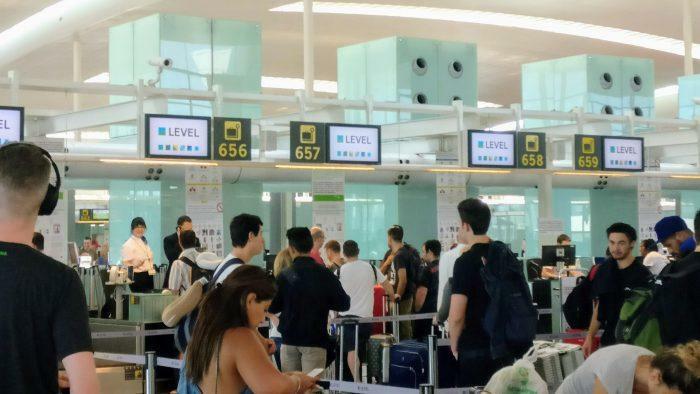 The check-in link on their website or from the remaining email takes you to Iberia check-in engine: LEVEL flights are both marketed under IB code and operated by Iberia. The online check-in process was mostly OK. The annoying part: I was not able to change my seat selection. I had prepaid and pre-selected my seat at purchase, and when I tried to switch to an emergency exit row (for an extra fee) I started getting errors. I tried a few times with no success. The surprising part: you can buy an upgrade to Premium Economy at check-in for 150€, which is a good deal, considering that the basic Premium Economy fare is 685€. 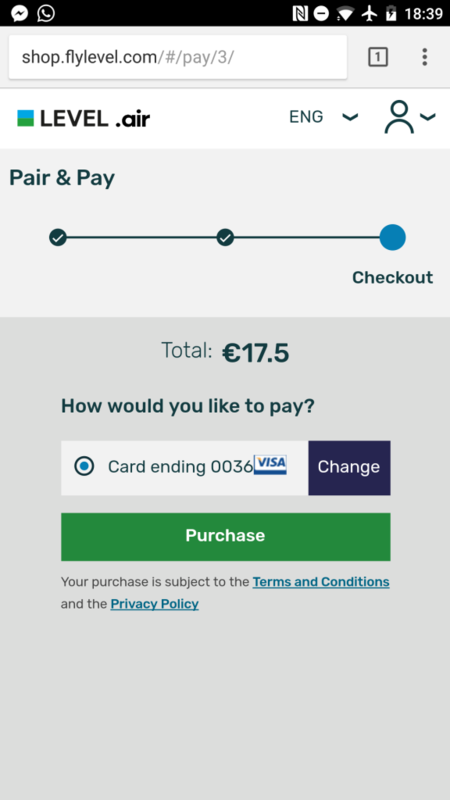 Buying the basic economy fare (180€) and then upgrading to their premium product at check in would cost you half of what basic Premium Economy costs. Of course you are gambling with availability so that’s the risk. Airport check-in opens three hours before departure time. Most of the people in line had already done their online check-in and were just dropping their luggage off. 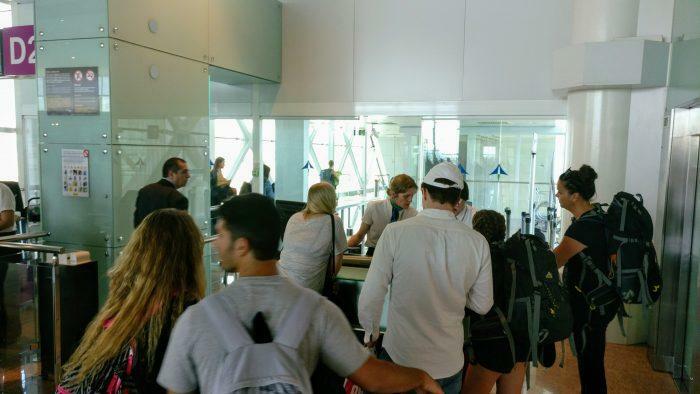 They were using 5 check in counters at Barcelona airport, 4 for Economy and one for Premium Economy. 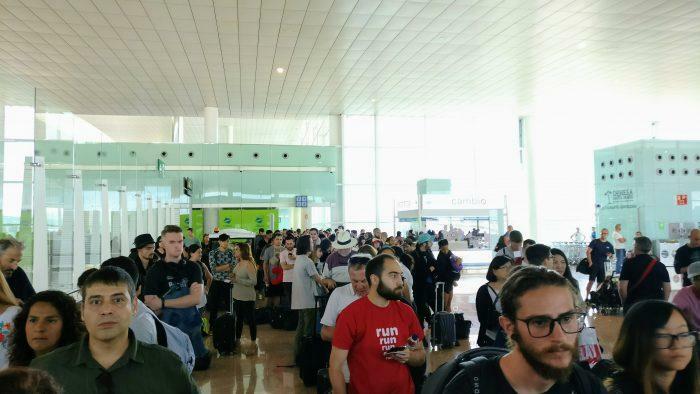 Boarding gate was not announced until 20 minutes before boarding time (a normal thing at Barcelona airport) . As soon as the gate was announced I headed there. 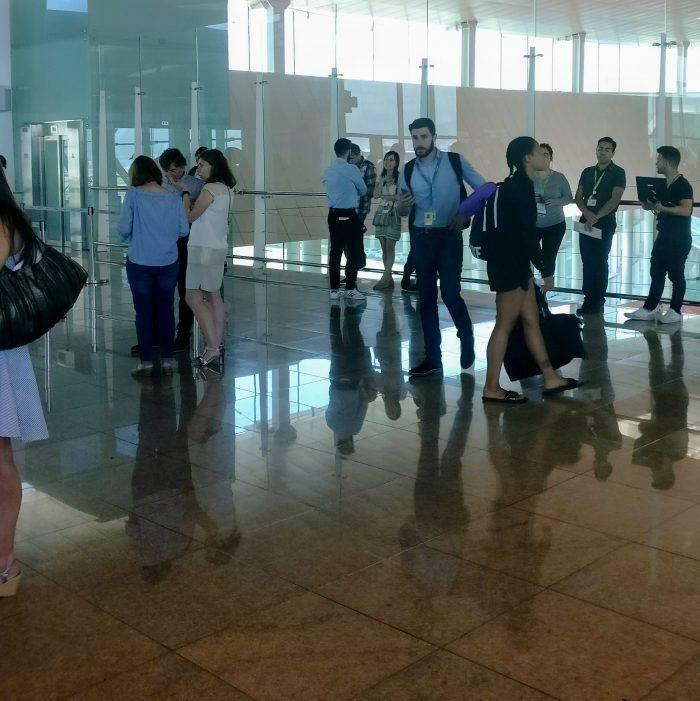 At the beginning there were more airline staff (press, PR and executives) than passengers around. They were all running up and down making sure everything was camera ready. 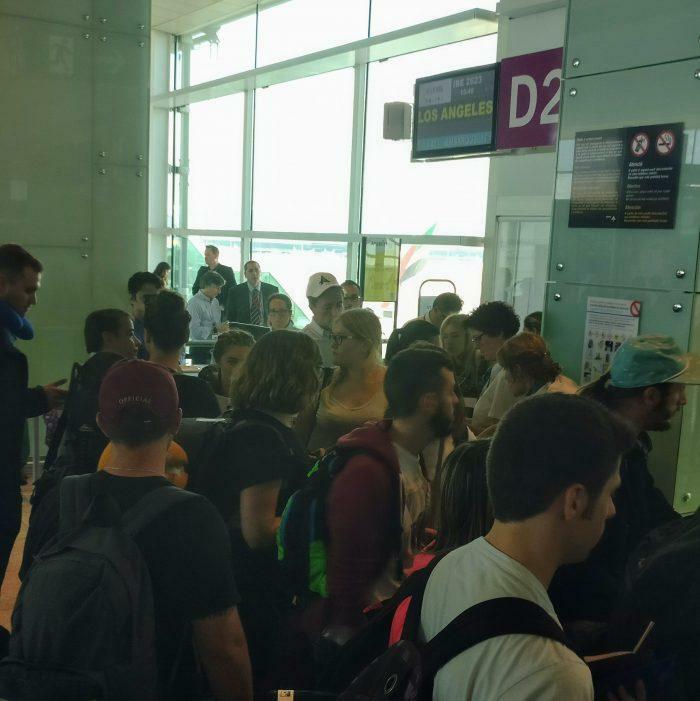 Passengers started randomly cuing in front of the gate until a gate agent started checking everybody’s boarding passes and dividing us in 4 boarding groups. So far so good. Once everybody was on their corresponding cue, a sad attempt of a flash mob happened in the side. 2 couples with colorful outfits and a luggage carts full of bags started dancing to LA LA Land’s “It’s Another Day of Sun”. 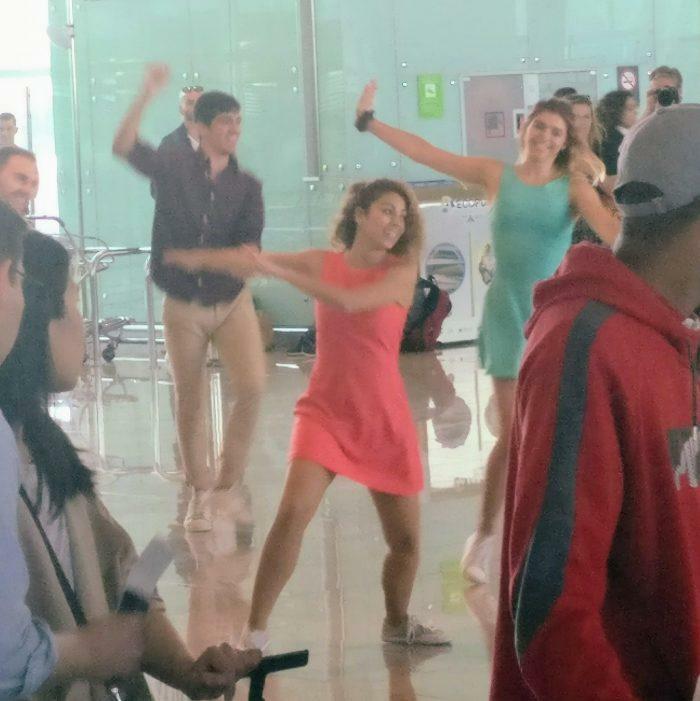 I give them (and the creative team behind it) props for the idea (it was kind of cute, we are going to LA, let’s dance to LA LA Land) and the effort (the dancers really tried), but 4 dancers do not fill an airport hall and the music was so soft we could barely hear it. Most of the people did not realize there was something happening almost until the end of the show. When boarding started, hell gates broke open. 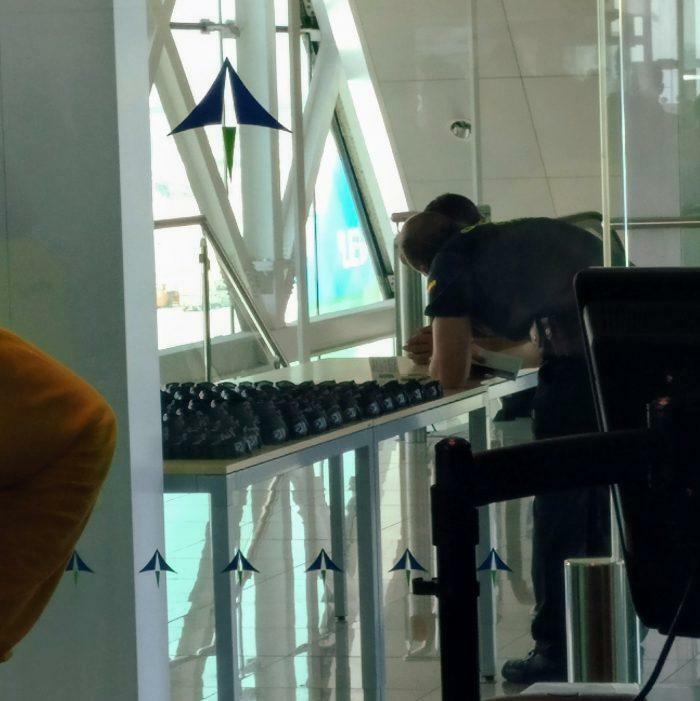 The gate staff had not finished dealing with the passengers randomly selected for security screenings, and there were moments of big confusion. Besides that, all the passengers with online check-in and traveling on carry-on luggage (like me) had not gone through passport/API check. One by one, after mobile boarding pass scan resulted on an alarm, we were directed to one of the gate counters to check our passports. It looks like nobody thought about this possibility before, and it added more chaos to the boarding process. And of course, hand luggage size was checked. Non compliant hand luggage was checked in at the gate for a fee. All passengers got a pair of sunglasses as an inaugural flight present. It’s another day of sun after all. 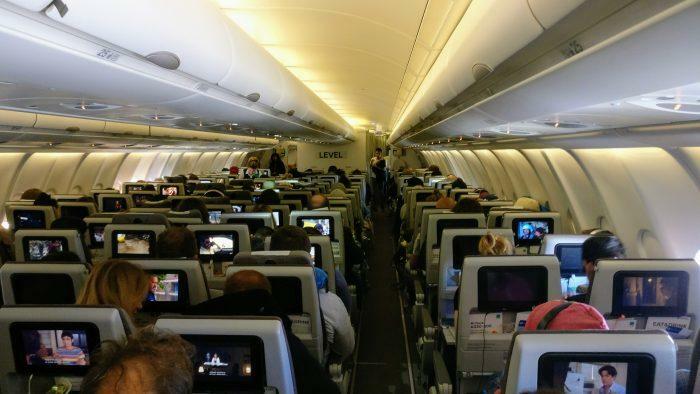 LEVEL starts operations with two brand new Airbus A330-200. The livery is white with a green and blue branded tail, some more branding near the front gate of the plane, and green winglets. It does not look as much as a cigarette brand as I expected! (For the record, I still don’t get the name or the branding). Flight staff consisted of 3 people in the cockpit and 8 in the cabin. Not offering a business class cabin reduces the staff requirements of course. The Economy cabin is tightly packed with 40 rows in a 2-4-2 layout. 40! There is a small mini-cabin of 3 rows (rows 4 to 6) up front right behind the Premium Economy cabin. I was seating in row 5 and it didn’t feel cramped or busy at all. There were also a couple of seats empty on the mini cabin. The rest of the plane was completely full. Seats 7A/B, right next to the front door had all the legroom of the world as there was no galley/bulkhead in front. The seats belong to the “thin line” category, but opposite to what United did with their Coach retrofitting, these seats come with decent cushion and they actually recline. Pitch is the main issue with the seat layout. 40 rows of Economy seats are a lot of rows, and an A330 only has certain length. It feels cramped back in the main cabin. 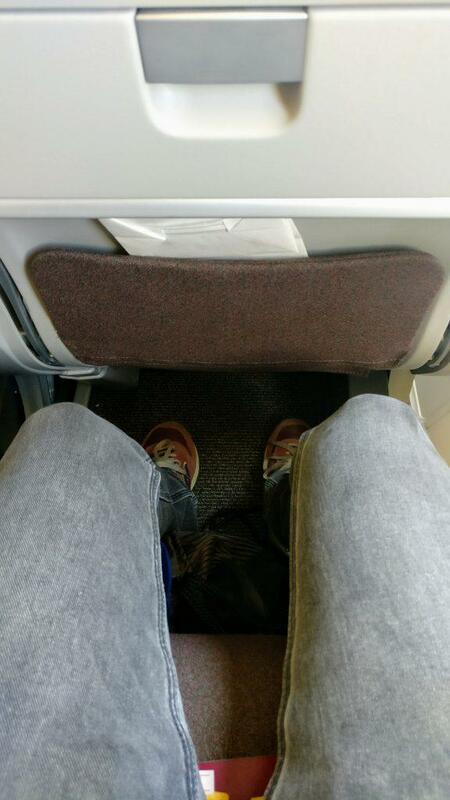 I’m 1,70m (5’7”) and I was relatively ok in terms of space. But my neighbor, 1,85m (6’2”), had troubles fitting in, especially when the passenger in front of him reclined his seat). 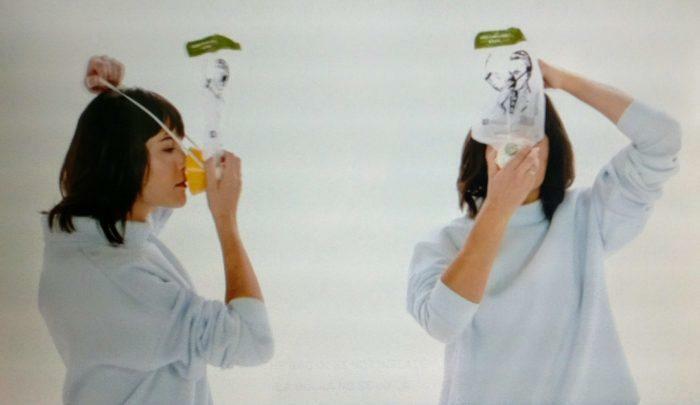 Both the video and the brochure follow the Airlines palette of white with touches of green and blue. 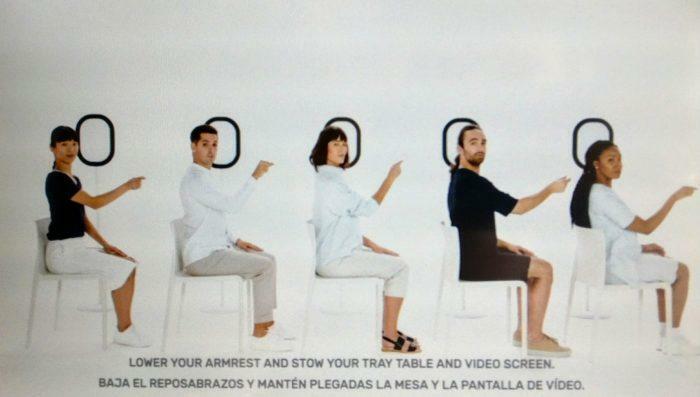 The video is minimalistic, the cabin big white space with white slim wooden chairs. The whole boarding chaos delayed our departure for about 30 minutes (at the scheduled departure time I was still outside the plane). After a brief speech from the captain apologizing for the delay and expressing how proud him and the crew were for taking part of the inaugural flight, we started taxiing. 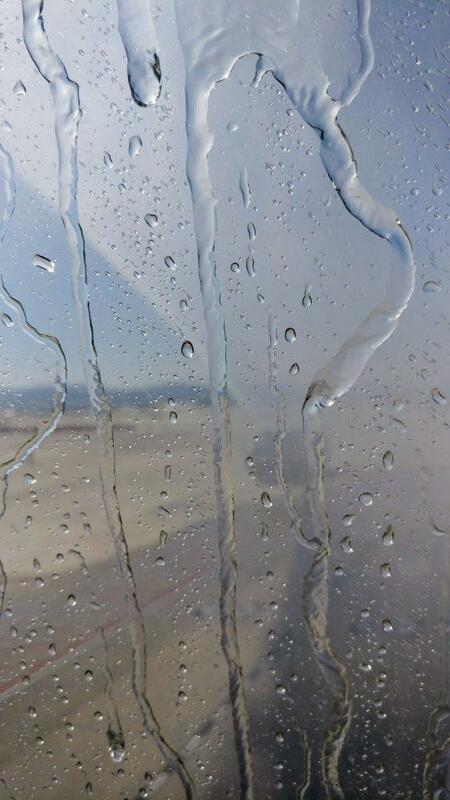 We got a water arch salute on our way out! We got water canon archs on our way out! 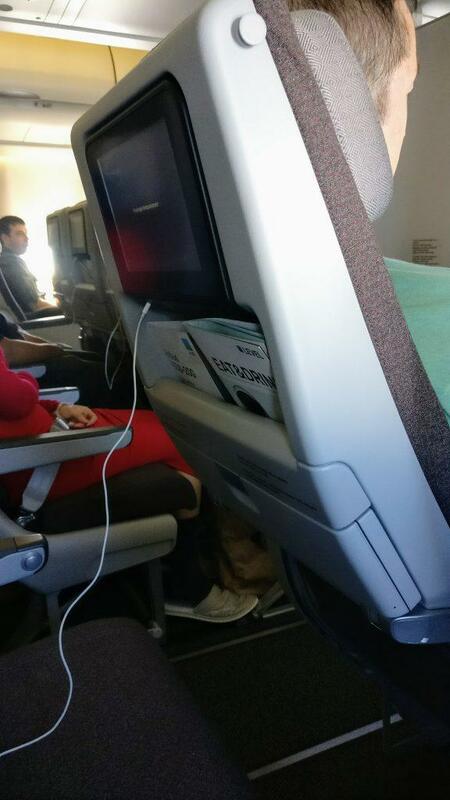 Every seat in the Economy cabin has a small (20 cm/8”) touch screen with an USB port and a stereo jack. 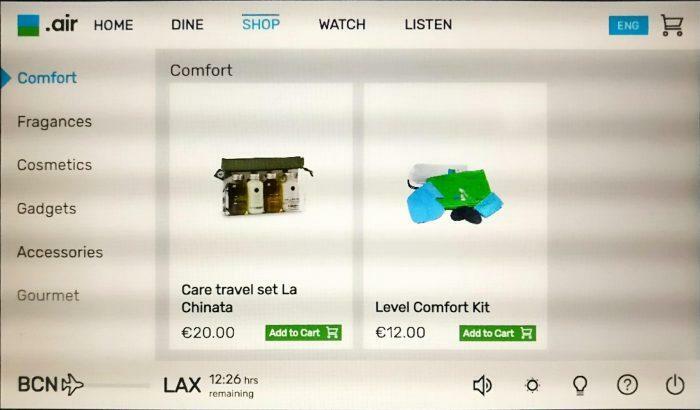 The home screen offers flight info, entertainment and shopping menus. The entertainment offering includes movies, TV shows and a range of music offerings and audio books. Both music and video options included several Spanish acts/productions. One thing I missed was a flight map or an exterior camera. 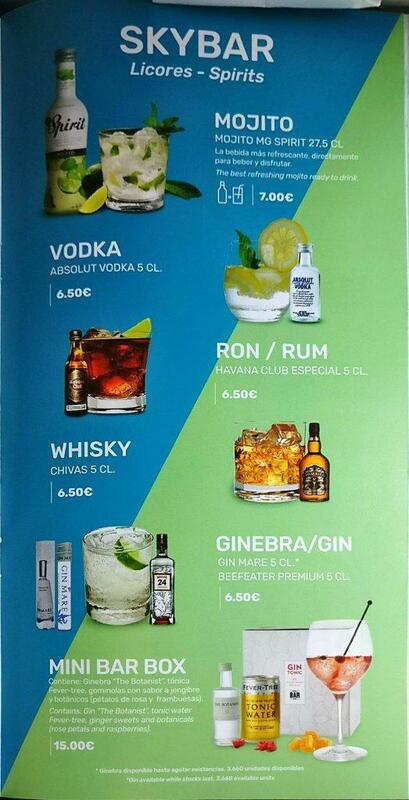 Also, all the content offered is licensed to Iberia, according to the water marks. LEVEL offers Internet on board for a (very steep) fee: 9€/40 MB, 20€/100 MB and 30€/200 MB. 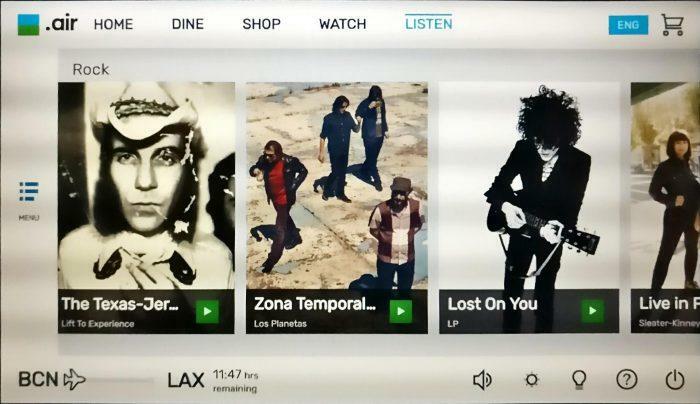 They sell the latest as a full flight package, but half way through I was out of data. Besides the regular shopping you can find on board of any airline (perfumes, make-up, watches, sunglasses), you can also buy a comfort pack for 12€ (including a neck pillow, a blanket, a a basic necessaire with toothpaste/toothbrush, earplugs, eye mask and travel socks). Earphones were also for sale. Probably the most popular item on the shopping cart as they got sold out fast. Food choices for sale included hot dishes, sandwiches and snacks. Beverage choices included soft drinks, water, coffee and tea, and a good selection of adult beverages. Being myself a Gin person, I was greatly surprised my options included Beefeater 24, Gin Mare, and a lovely kit of Botanical 22 including raspberry and rose petals garnish! The wine selection includes two choices of Spanish red wine, two choices of Spanish white, and Cava. Decent selection. Beers not so good. 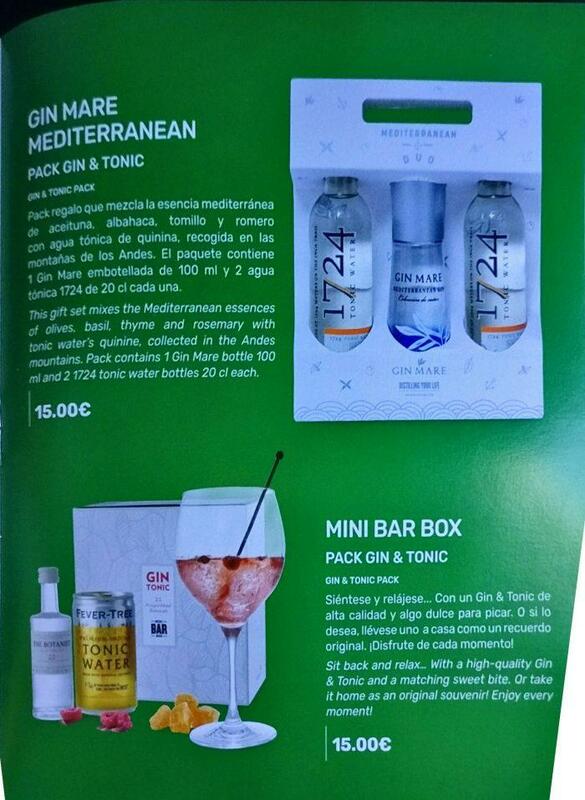 Of course I went for the gin & tonic pack, it was good! The coolest part was the purchasing process. 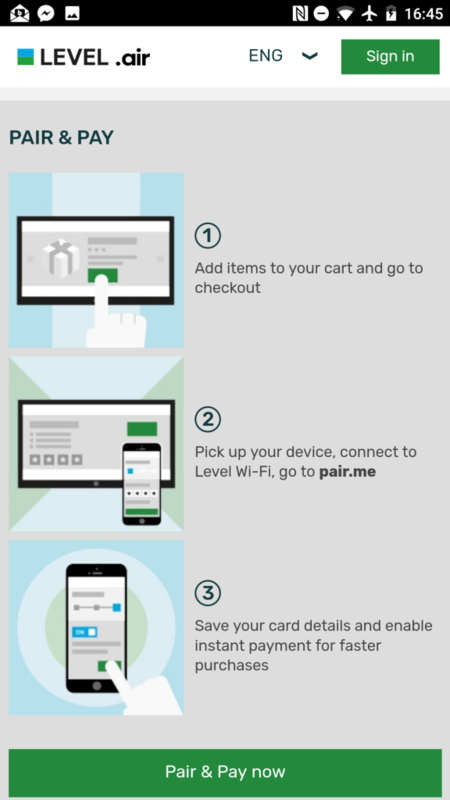 After selecting the items on the screen, you got the choice to pair the screen purchase with your WiFi connected device and to pay using the card info stored on your profile. The buying experience is seamless and so easy. 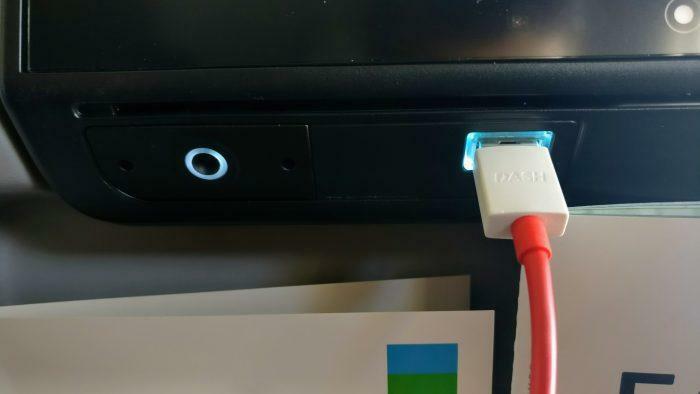 The even have “digital support” on board, two guys with a genius-bar-kind-of-look who were dealing with the screen purchase process, helping put and explaining to the passengers how to use it. Those not willing to open an account could order their items and pay to a flight attendant using their card. I had prepaid for my meals (35€) when I purchased the ticket. 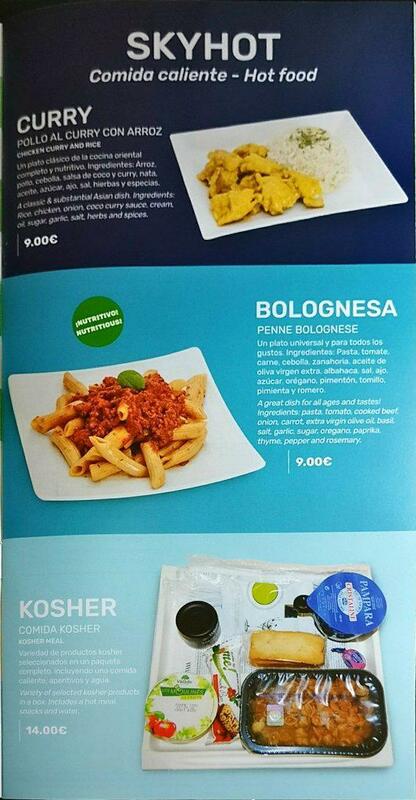 The prepaid menu consisted of a lunch offering after departure (including wine/beer) and a snack before landing. 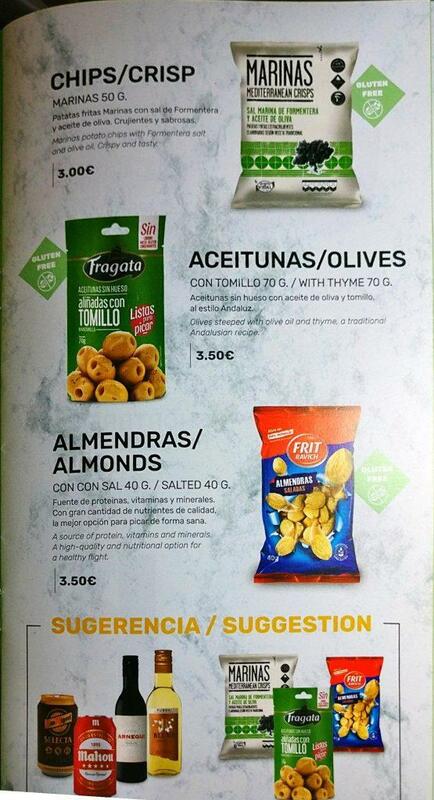 Food choices were different from those offered in the for-purchase menu. 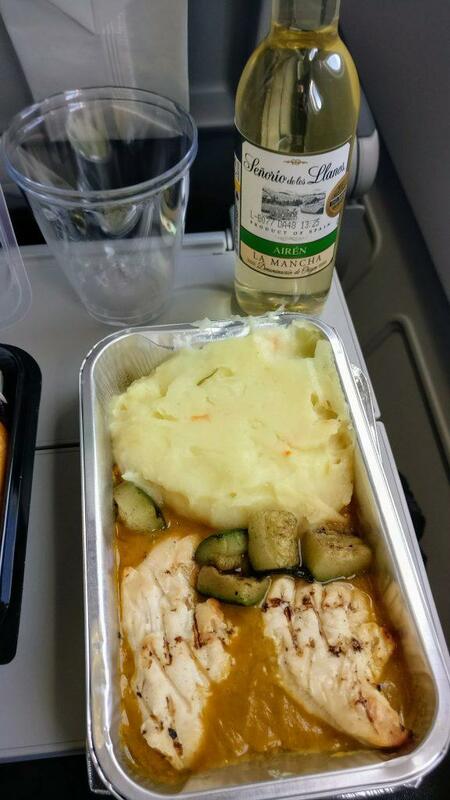 The lunch serving was surprisingly edible (considering it was an Iberia operated flight): dried apricot and sunflower seeds salad, chicken breast in Pedro Ximenez reduction, smashed potatoes and chocolate cake. White wine and water were my choice of beverages. 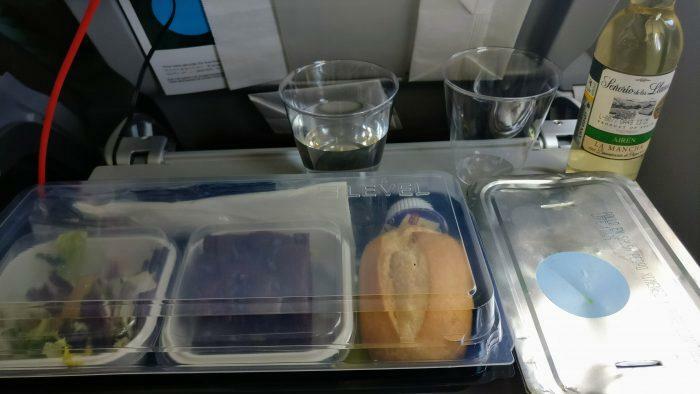 The snack service was a cold ham and cheese croissant, yogurt, chocolate and a soft drink. No alcoholic beverages were offered with the snack. Midflight the cabin crew handed ice creams to all the passengers to conmemorate the inaugural flight. 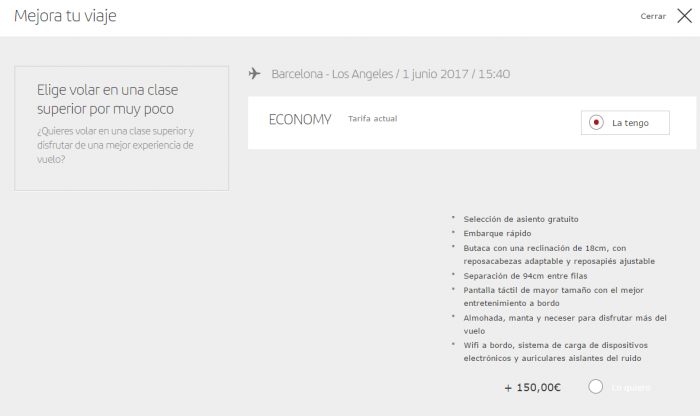 LEVEL discount economy fares get 10 % accrual on Iberia, so I’ll get about 600 avios for this flight! 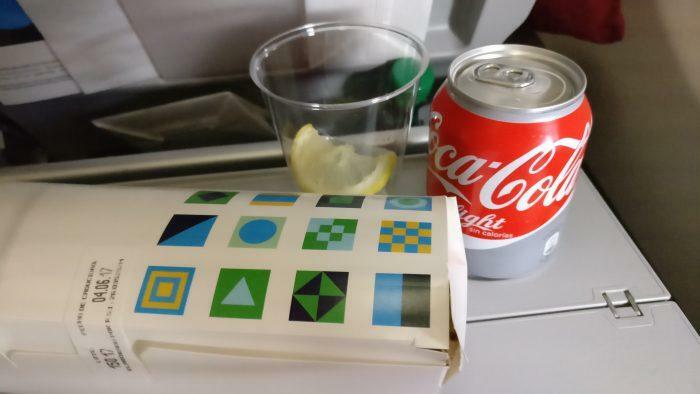 The flight was OK. Seats were comfortable (to an extent) and food was edible. 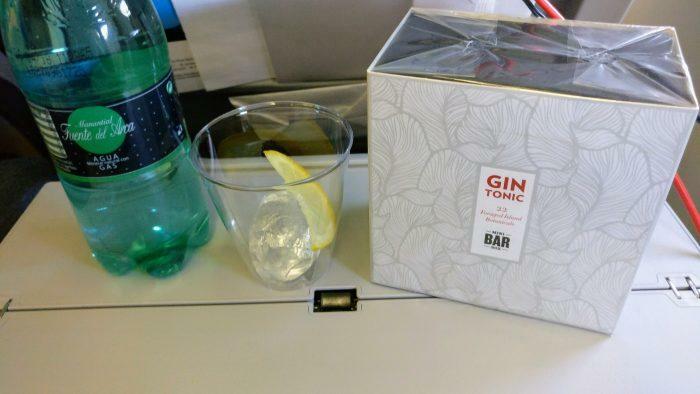 Drink choices were correct and the IFE was also correct. The product works for the price paid. The only drawbacks: pitch is tight and internet is VERY expensive. I guess there’s nothing to do with the pitch, but they have to rethink their internet pricing. Previous articleUPDATE: Check Your SPG Promo Dashboard For New Bonus Offer!